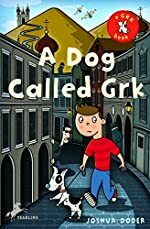 Review: Suspense, action, dilemma, and perplexity are all words that describe the book, A Dog Called Grk, written by Joshua Doder. This book is the first in the “Grk” series that will blow people’s minds away. One chilly day, a boy named Tim is followed by this small black and white dog. Tim knows that his parents will kill him if he lets a stray dog indoors because Tim’s mom is allergic to dogs. Though his parents will say no, he still decides to ask if he can keep the dog, but of course, they say no way, never. After finding out who the dog belongs to, Tim goes on a top secret mission that his parents wouldn’t approve of, and, if they found out, they would ground him forever. Now Tim is faced with the challenge of getting the dog back to its owners. He will have to maneuver through a high-security prison without alarming anybody, he will have to pilot a real life helicopter with the only help of some piloting skills he earned while playing some video games and he will have to make a hair-raising run to the border with a few friends. And his only companion for doing all these mind-boggling things, is a brave little dog named Grk. I loved the book, it was very intense, and I think my heart skipped a beat when I found out that Tim really flew the real life helicopter. My favorite part though, was the part when Tim, Natascha and Max escaped from the high-security prison, with the only cover of a few hundred criminals who were making a getaway from all the prison guards who were trying to stop the criminals from running away and causing even more havoc. When I was reading this part in the astonishing story, I almost fell of my chair that I was sitting on. That was how suspenseful the part in the story was. I also liked the part where Tim, Natascha, Max and Miranda confused and out-smarted the border guards so that they could make a run for it, without letting anybody know where they went. On a scale of 1 to 5, 1 being the worst and 5 being the best I would rate this book as a 5! This was one of the most breath-taking books that I have read before in my life. I would recommend this book to anybody who likes to read suspenseful book with just a hint or two of action. No wonder this book got a compliment from, Time Out New York Kids. This is what Time Out said, “This first entry in the series crackles with Doder’s crisp prose and absurdist sensibility.” I can’t wait to read the next in the series, the next book is called, Grk and the Pelotti Gang, to me the next book in the series sounds like even more action and suspense combined to make the perfect 2nd book in the “Grk” series. Review written by Karen, Grade 6. Date of review: December 2009.